After a promising start to Southport’s League career, 1922-23 was an anxious season for the club with the forward line the chief weakness. Although the directors derived a certain amount of satisfaction from the fact that the club retained their status without having to apply for re-election, fewer goal’s were scored by Southport than any other club in the Division, and Billy Glover’s departure to Wigan Borough made matters worse. Glover had drawn attention to himself the previous season by scoring those six goals against Grimsby Town and totalling 26 in the League. 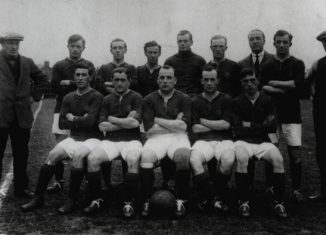 In 1922-23 the club finished 17th, securing 31 points and scoring only 32 goals shared between 14 players with one own goal. Glover was top scorer with seven goals despite his departure midway through the season. His transfer netted £1,200, which meant that the club made a small profit of £88. During the season the ‘Port scored only 21 goals at Haig Avenue and a mere 11 away from home. These totals sill constitute the club’s record lowest both horns and away. Only twice did the team score three goals. Defensively there wasn’t much wrong with the side, only five teams having fewer goals scored against them. Helsel!, having displaced Drabble early in the previous season, was a model of consistency in goal, while Tom Sinclair and Billy Little were as good as any defenders in the Division. At full-back there was Joe Bainbridge, signed from Blackpool for the previous season, who was a fearless tackler with a hefty kick, and his partner, Billy Greatorex, was speedy and strong in the tackle. On the other hand Jimmy Fay—coach to the senior side—was coming to the end of his glorious career, and team captain Lol Abram declined to such an extent that his contract was terminated in Febraury, 1923. The veteran Semple was no longer the terror of defences he was in his Central League days. On a happier note the Reserves finished runners-up in the West Lancashire League, and only goal average denied them the championship. Their full record was: Played 42, Won 16, Drawn 3, Lost 3. For 62. Against 25. Points 35. In addition they reached the semi-finals of the Richardson Cup. At the same time the ‘A’ team, Blowick, were playing on a ground at Butts Lane Halt, and produced one or two promising youngsters. In the close season there were changes on the board; T. Bolton and Ray Hall were elected in the place of Alderman Snow and Fred Read, who bath resigned. The Third Division North was increased to 22 clubs, and Doncaster Rovers and New Brighton were admitted. Meanwhile, Stalybridge Celtic became the Third Division’s first casualty, not seeking re-election at the end of the season. With the trade depression throughout the 20’s it was the industrial towns which suffered most—many would-be supporters could not afford the shilling to go to the match. A lot of clubs, including Southport, continued solely on the prospect, even the hope, of receiving a substantial transfer fee.